Image: The Broken Column is one of the most spectacular formations in Lucas Cave. It was broken by floor movements many thousand years ago. © Mathias Duckeck. Open: All year Mon-Fri 11:30, 14, Sat 10:30, 11:30, 13, 13:30, 14, 15, Sun 10:30, 11:30, 13, 14, 15. Dimension: L=20,000m, VR=200m, A=790m asl, T=16°C. L=528m. Guided tours: D=90min, L=860m, St=910. 1860 discovered by Nicholas Irvin and George Whiting. 1860 opened to the public. 1892 passage from Grand Arch to Lucas Balcony discovered by F. Wilson. 1897 passage from Grand Arch to Lucas Balcony used as new entrance. 1901 short tunnel cut from Lucas Cave to Balcony. SEP-2004 new light systems with energy saving lamps. Lucas Cave is the most interesting cave at Jenolan. It is recommended to visit this cave if you do not have time or do not want to visit more than one cave. It offers the biggest chamber of all Jenolan caves and a wider range of different speleothems. All in all a worthwhile visit of 90 minutes. The Cathedral is the highest chamber of this tour, and also the highest chamber of all Jenolan caves, 54m high. It is used for weddings and for concerts for example by Dame Joan Sutherland or the Vienna Boys Choir. There are now and then concerts in this hall. The dates are published on the official website of Jenolan. 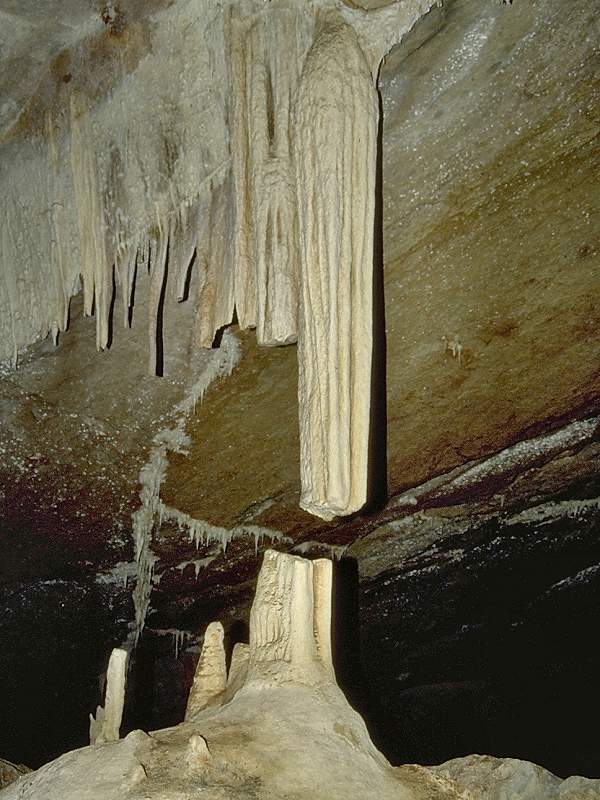 The most impressive speleothem is just a common pillar or column, where stalactite and stalagmite have grown until they joined and formed a column from the ceiling to the floor. But this one is special as it is broken into two parts, with a rather wide gap in between, Thats why it is called Broken Column. The reason is porbably a movement in the debris it has grown on. The Jenolan cave system has a lowest level with a cave river. Here at Lucas is the only possibility to get a glimpse of this underground river. The blue green water flows 20m below the tour path, the gorge is crossed on a bridge. Lucas cave was named after John Lucas. He was a local parliamentarian and was responsible for having a reserve declared for the protection of the caves. Search Google for "Lucas Cave Jenolan"
Lucas Cave, another gallery from Jenolan, with several pictures from Lucas. Lucas Cave, some pictures and a short description.